Elegantly curvacious and incredibly light, the stylish Samsung SGH-X460 weighs just 75 grams and measures a diminutive 86x43x43mm. The smooth lines of the X460 are complemented by Samsung's clever internal antenna and stylish design. Although the X460 is a lightweight phone, it's no lightweight in the features department, with a 128x160 pixel main display in 65,000 colours, secondary 96x64 pixel display and improved styling which may well make the Samsung X460 an indispensable fashion accessory. The Samsung X460 is a dual-band GSM phone with GPRS data, a WAP 2.0 browser, Java for games and other applications and polyphonic ringtones. The SGH-X460 is available in four stylish colours (depending on operator) and comes with 8Mb of memory, which is great for saving games and ringtones. Talktime is quoted at 3.8 hours, with up to 9 days standby time. Available now on Vodafone and O2 Contract and O2 Pay-As-You-Go. Subscribe to our newsletter for more updates. 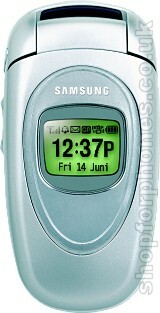 If you want more information on the Samsung SGH-X460, subscribe to our mailing list. Also, the Update newsletter contains general news about new phone releases.